The latest phase of a major project to tackle congestion and improve journey times for drivers on the M6 in Cheshire is due to start next Monday (18 July). Highways England is upgrading a 20 mile stretch of the motorway between junction 16 near Crewe and junction 19 near Knutsford to a smart motorway. 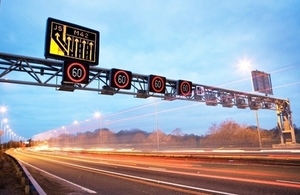 The hard shoulder is being permanently converted to an extra lane, increasing capacity by a third, and new traffic monitoring technology will allow variable speed limits to be displayed on overhead electronic signs to keep vehicles moving at a steady speed. Temporary narrow lanes and a 50mph speed limit are currently in place between junction 18 (Middlewich) and junction 19 to allow three lanes to be kept open in each direction, and ensure the safety of drivers and road workers. The roadworks will now be extended down to junction 17 (Sandbach), requiring some overnight carriageway closures, to enable construction work to start on this stretch. Roadworks on a separate project to install a new concrete central reservation barrier and carry our bridge repairs were lifted at the weekend between junctions 19 and 20 (Lymm), which means the total length of roadworks on the M6 in Cheshire will remain roughly the same. Highways England Project Manager Kate Beirne said, “we’re determined to do all we can to minimise disruption while the smart motorway scheme is taking place, and will be keeping three lanes open during the daytime throughout the project. “We’ll need to close a short stretch of the motorway for a few nights to install the temporary narrow lanes and 50mph speed limit between junctions 17 and 18, and have scheduled these closures to take place overnight when traffic levels are at their lowest. The southbound carriageway will be closed overnight between junctions 18 and 17 for four nights from Monday 18 July to install the temporary narrow lanes and 50mph speed limit signs. The northbound carriageway will also be closed overnight for four nights from Monday 25 July. The closures will take place between 10pm and 6am, and drivers will be able to follow clearly-signed diversion routes including separate diversions for lorries to avoid a low bridge. Construction work on the smart motorway project began in February and work has been taking place between junctions 18 and 19 to remove the old steel safety barrier in the central reservation and dig the foundations for a new concrete barrier, along with surveys, ecology work and drainage improvements. A similar smart motorway scheme on a 15.5 mile stretch of the M62 in West Yorkshire, which was completed in 2013, has resulted in commuters saving up to 30 minutes each week.